This resource helps students identify some of the issues faced by Uganda, an example of a LIC. It then focuses on development through the implementation of sustainable health care options. 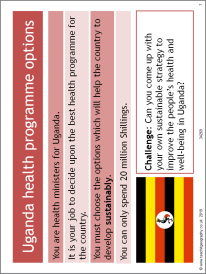 Students complete a decision making exercise deciding which health care options they feel would be most benefical for the people of Uganda.